There are a million ways to make couches into beds and the best way is very much dependent on your situation. We went with the VW Rock and Roll Hinge because of the ease of use and the large amount of accessible storage the design provides. It works for both a double fold (our application shown above) or a triple fold (classic application shown below). They go from bed to couch and back again in under 30 seconds (Frequent Stops IG). They provide storage that is the same size as the base of your couch. You never have to remove the cushions! The plywood requires some extra support when making a long span over 48". We used 1" by 2" angle iron along the edge. They are a bit pricy, just over $100 dollars. 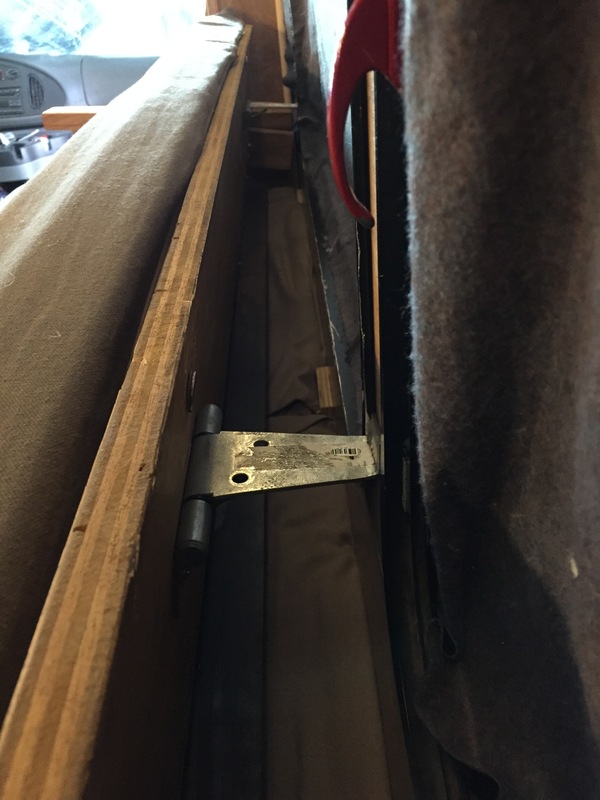 When making a double fold there is a gap between the bed and the wall (we made foam inserts to fill this gap and metal supports to let the back rest on the wall). 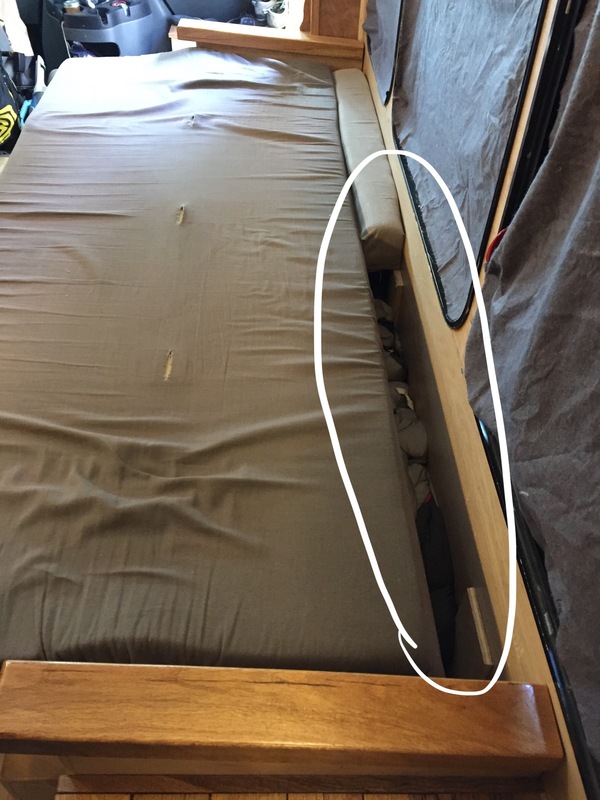 Although you can use that gap to store your bedding (circled portion of the image below). 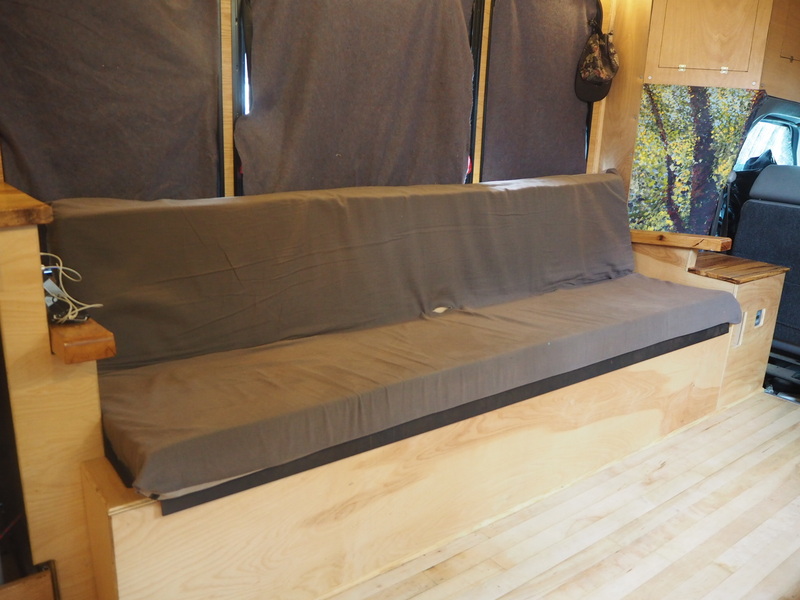 When I had 4 people, I had a 7 foot long dinette, and the backs on each side folded up to make bunk beds on each side, the table could also be put down to make the bottom bed into a queen. It worked but it was a pain making the beds everyday. In my bus, I had queen sized bunk beds permanently across the very back. That was much better because the beds stayed ready to crawl into. A 4 person dinette across from a sofa/bed in the front made a nice living/dining room. that would also make into two more double beds, then in the middle was the kitchen, bathroom, and storage/closets. It was very convenient and comfortable. We have been playing with the bunk bed idea. You didn’t mind having that amount of space loss in the common area? What size bus were you in? I really felt like I utilized the space in both rigs as efficiently as possible, balancing between space and comfort for everybody. The bus was much better than the van, even though it wasn’t much longer. What it was, was wider, which allowed beds to go across the back instead of lengthwise. I think my bus had about 14-15 feet behind the driver, and that van had about 12. Both were about 20 feet long on the outside, but the engine/cab area on the bus was shorter. We have built and lived in both. In our first build, somehow the convertible idea was appealing. Tidy during the day and allowed for entertaining others, yet comfortable at night. In reality, it was a huge PITA every day and night folding that thing up and down and was less comfortable because of the gaps between mattresses/cushions when it was a bed. First decision in our second van (and beyond) was easy. Full time bed! We use the same perfect mattress we had in a house, can raise the bed further while gives us a TON more storage space under and don’t have to rock-paper-scissors if one person want to get horizontal while the other wants to stay up. 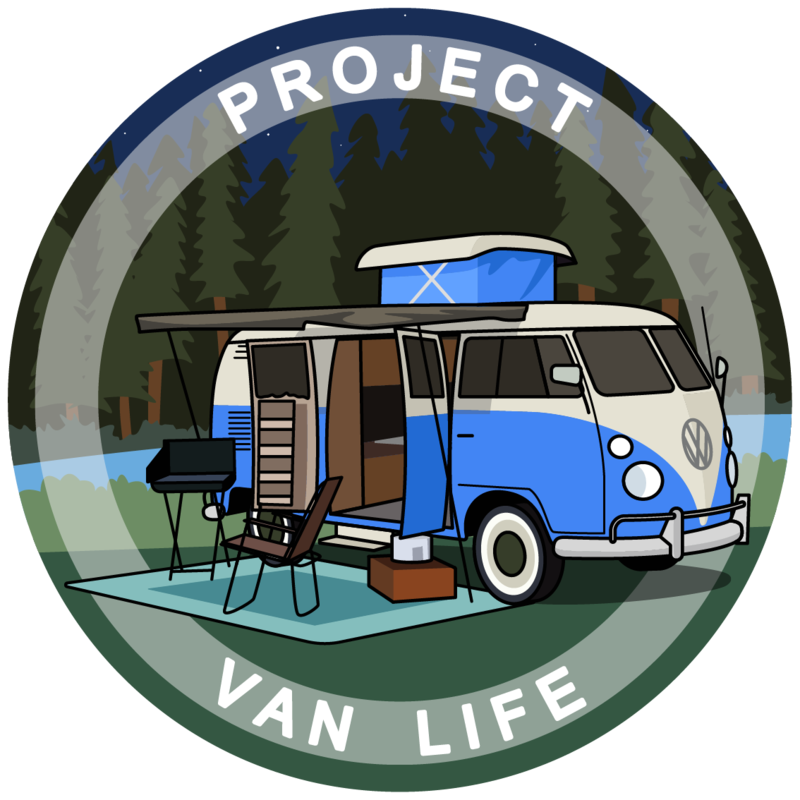 That being said… were older than the average van lifers… so this could just us being “ready” for more comfort. Hey… you asked. This is awesome. We are currently trying to design a bed that will live mostly as a bed but can also be converted into a couch and when guests are over. Hoping for the best of both worlds. What kind of van are you in? First van (with pull out bed) was a 67 VW bus. After that a sprinter. In my current rig, I have a normal house style futon sofa/bed. I extended the legs using telescoping metal conduit, designed to work similar to adjustable cabin tent poles, to raise it up over the wheel well, and also allow me to level it if I’m parked on uneven ground. Simple and effective but basically fool proof. When I’m alone, I usually just sleep on it in sofa mode, and since I don’t typically use it for seating, I just leave my bed ready to crawl into, with no set up necessary. If I’m having company, I can remove my bedding in seconds to create extra seating. For a sleep over it will convert into a double bed. I prefer a permanent bed set up, and separate seating. I have an old, super comfortable, swivel, rocking, reclining desk chair to lounge or work from. Comfortable enough to sit in all day long, or even fall asleep in. I have a 12v heating/cooling/massage seat cushion in it, as well as one in my drivers seat, and a 3rd spread out under my sleeping bag on my sofa. Talk about comfy… they make a world of difference. You can find the most amazing things at truck stops, including these and 12v heating/cooling blankets which I also use and love. They use very little power, and mine have thermostats to hold the temperatures exactly perfect. Both types are cheap, only about $20 each, and worth every penny. I’m currently in a 1973 Dodge Travco high top camper van that had been gutted before I purchased it. I restored the original carpet & padding, wall & door panels, and window trim from passenger vans in wrecking yards, then moved my new new furniture in and secured it, rather than actually building it in. Where can we track down pictures? I’d love to see that set up. We are currently trying to design a bed that will live mostly as a bed but can also be converted into a couch and when guests are over. Hoping for the best of both worlds. This is my preference, too, but I’m still looking and haven’t decided on a design yet. I just don’t like the idea of having to piece together separate cushions to form a bed, and then having to put the sheets on it every night. Thats the biggest pain in the biscuit I can think of. I did find a design possibility that I actually like though and others might find useful. In my head, I like the idea of a murphy bed that converts into a desk when not in use. 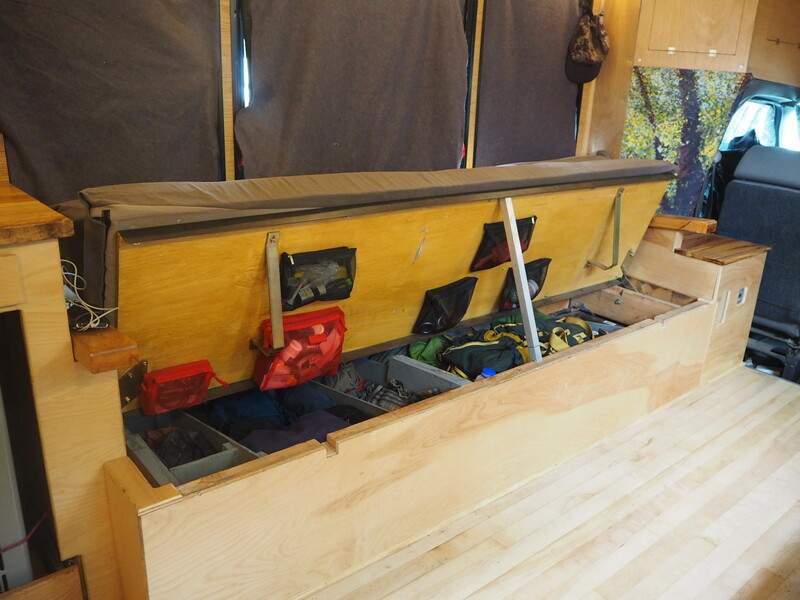 The bed is always made up and ready for sleeping but opens up the space during the daytime and doubling as a workspace. 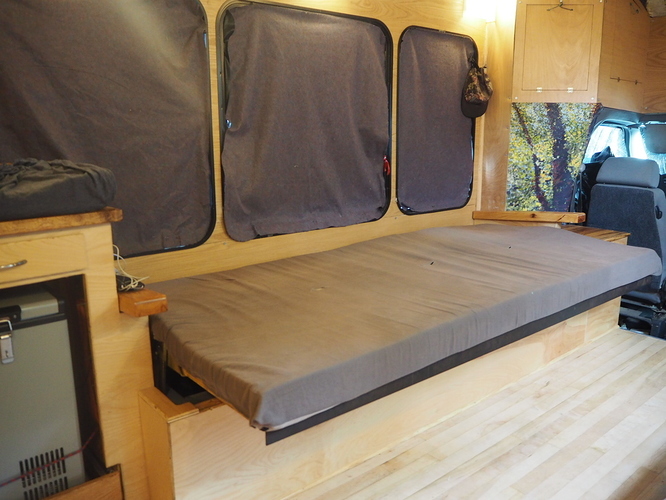 Heck, I’ve even seen a queen sized murphy bed in an RV that doubles as a complete dining room with a table and two bench seats that easily fold away just by lowering the bed! Now THAT would be something!